It kicks. Seriously. Five shots of tequila and one shot of Kahlua, and, well… it should kick. It’s a good thing that I took photos before I downed the glass of Coctel Adelita. If I had insisted on sampling it before taking the photos, I might have had a serious case of camera shake and the images would have probably turned out badly blurred. The recipe is from the same article where we got the chelada and México Lindo recipes. I’ve never met the author, one Kate Sedgwick, but I like her very much notwithstanding. Not only do her recipes work, she’s got her history and politics straight too. Okay, I don’t know who Adelita is. After all that reading about the history (or is it non-history?) of the margarita, I don’t have the energy to investigate who Adelita is or might be. The original recipe measures the ingredients by the ounce; Speedy measured by shot glass. Which is probably why the drink kicked really hard. Shake to mix the ingredients and make everything ice cold. Garnish with a twisted lemon slice. 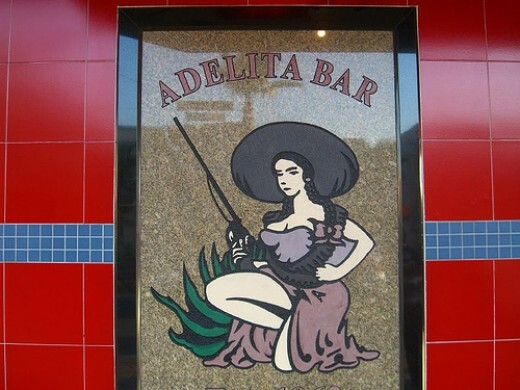 Its ‘Adelita’ name probably derives from a famous Red-Light District strip bar in Tijuana Mexico. Whoa. That makes the drink sound soooo naughty LOL!